Mothers love it and so do the babies! This beautiful and eye-catching bag is an absolute must for every mother! It’s a lightweight and easy to carry a backpack which you can just sling over your shoulder and go on an adventure with your cute baby. This bag has lots of space which can be used to store milk bottle, water bottle, baby clothes, diapers, and towels. Made of thick polyester material, it’s a strong water-resistant bag for all weathers. It has three heat insulated bottle pockets on the front which can keep your baby’s milk and water bottles warm for as long as four hours. It’s designed in a way that you can hang it in a stroller or a trolley, making travel much easier for you! Littles ones can be quite a handful of times and it’s easy to lose valuable things like jewelry or cash when you are trying to pacify your baby. With its anti-theft back pocket, you can keep your things safe and out of the harm’s way. In a nutshell, it’s not just a cute and stylish bag which looks great but it's a practical bag which can make life a lot easier for mothers! Very neat, well made, Spacious and comfy. I am superhappy! lovely!!! great quality, great size, looks really good! I love the bag. Good materials and detail. All my 3 years triplet's stuff can fit. 3 jackets, 3 sets of change clothes, 3 diapers, dry and wet tissue, feeding thermos, 3 water thermos, and busy bag. Thank you. The bag is great, exactly as I expected. The bag is very roomy and very functional, I love it. It fits all my baby's things. really super thing, absolutely value for money! high quality sewing, super quality material, waterproof zipper pocket inside. super quality...!! big many compartments and much space to put many things. lovely! I love it. It´s exactly like the pic. I recommend other mom´s to buy it. i love it .. its very useful . recieved in two weeks .. great quality . thank u . grade!!! backpack super! pile pockets inside, including wet pocket, thermal bottle three compartment, valuable pocket on the back, to the bottom of the content access via backpack pockets at sides, rings hanging stroller, lace with key ring. and. is made very qualitative, color super. very nice, my girl was very happy. thanks! All is ok to love it. Great bag, great price and speed to delivery. Thank you. Wow, nice roomy bag for my baby's stuff, beautiful backpack!!! loved! very satisfied with this bag. Amazing, just as described. Beautiful diaper backpack, with lots of space!! Great color. Sewed very well, no smell, high quality. Very very happy with my purchase. Very satisfied with the bag! Seems to be a really good quality! Color is nice bright, so I’m really happy! I definitely recommend this. 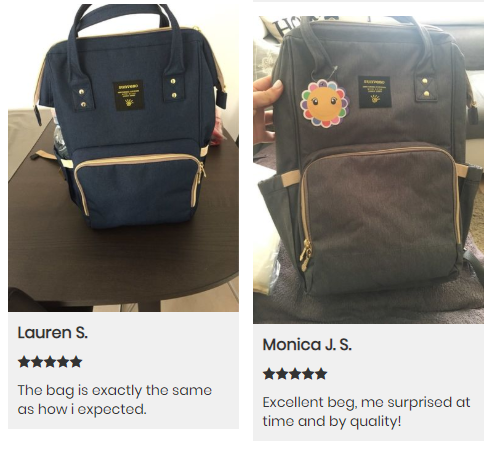 Excellent quality bag, absolutely recommend, took for my sister and she loved it. Gorgeous bag, easy to carry and cool, stylish looks, loved it. Bag is really very nice and convenient. like it very much. i would recommend. Ever super nice excellent, QUALITY material, i have to! and also nice roomy. Just super bag! very comfortable!!! quality is good, and looks so cool. The bag is exactly the same as how i expected. Excellent beg, me surprised at time and by quality!